For prices and availability click the visit new website above. Booking your holiday with us gives you choice to select the Caravan and the location. Our Caravans are inspected prior to your arrival. We meet all our guests at the Caravan to hand over keys and answer any questions you may have about your stay. We are committed to provide the very best service to make sure your holiday runs smoothly from making a booking to handing over the keys, you can rest assured you have made the right choice by booking with ourselves. Caravans to hire and rent on the sea front with breathtaking sea views of Ayr, full veranda and patio furniture.Several have Wheelchair Ramp Access suitable for a wheelchair also DISABLED CARAVAN HIRE. We also have Caravans which are located next to each other to cater for larger families who like to holiday together. We do allow Pets in several of our 2 Bedroom and 3 Bedroom caravans to rent (check for Pets welcome above). Can`t stand the idea of leaving Laddie in a kennel or at home while you`re off on holiday? Youre not alone. Taking a holiday with pets is a popular option for pet owners who want to share their holiday with their dog. With more pet-friendly caravans to rent than ever before, taking your four-legged companion to the coast is an easy and inexpensive option for animal lovers. All caravans are kept to a High Standard offering our guests quality and luxury. We also do short breaks. Personal Meet and Greet service at your Holiday Home. Quality private Holiday Homes of all grades. Sea views and Exclusive locations available. Pets welcome in over 22 Holiday Homes. View actual photos of the Holiday Home you are booking. 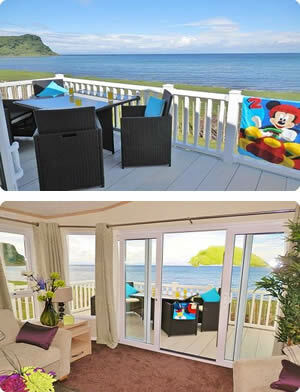 Holiday Homes located next to each other for Family Group Bookings. View each Holiday Home location and choose your preferred area. Short Breaks available all season. You can Reserve your Holiday on line using the on-line booking form. You can pay your deposit using your credit/debit card, pay pal or pay your deposit by post by cheque or postal order (we require a booking request to be made to reserve caravan). We are so confident that we offer the very Best Service and Value for ALL our holiday guests that should you find an identical caravan for hire at Craig Tara cheaper on other web sites on the internet, we will try to match the price or, even better, beat it! COME ON AND GIVE US A TRY !!! RESERVE ON-LINE TODAY AND SAVE ££"S.
Funworks passes are optional. If required they can be purchased from Reception. They are required to use the swimming pool and entertainment complex. Moderate extra charges apply for certain activities - please check. Craig Tara Holiday Park - is a Haven Holidays family holiday park set on the west coast of Scotland overlooking the Isle of Arran with direct beach access. We cannot except bookings from under 21`s, group bookings of all under 21, all male or all female groups. Bookings are not definite until confirmed by us and some may be refused. Copyright 2008 UK Copyright. All rights reserved. Craig Tara Caravan Rentals - Craig Tara Caravans for Hire Unauthorised duplication of photographs and material without prior written consent prohibited.